Barrelling full steam ahead into the season, Ohio Roller Derby hosted Roc City Roller Derby (Rochester, NY) for two incredibly close-scoring games that each saw numerous lead changes and outcomes determined in the closing minutes. 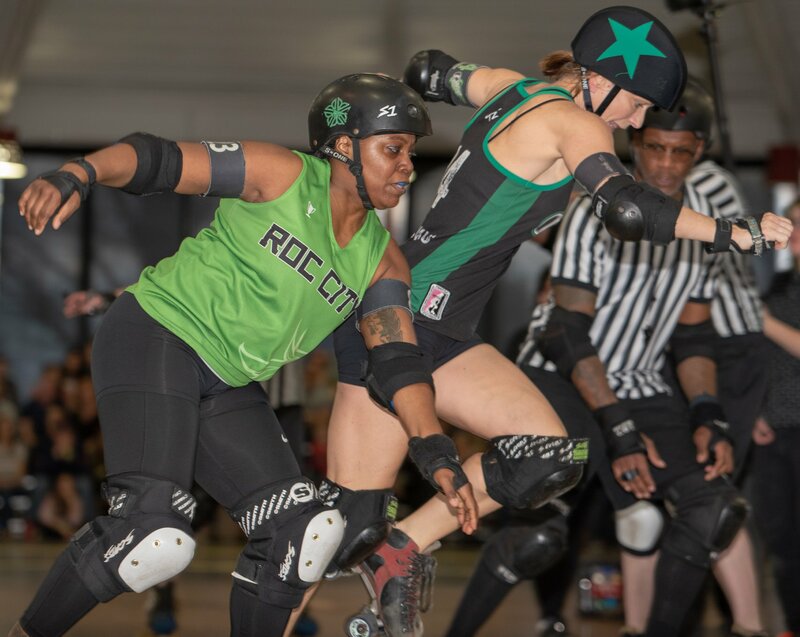 Meeting for the first time since 2016, the Ohio Roller Derby All Stars and the Roc City Roc Stars fought for every point in a back-and-forth battle, with neither team managing to accumulate a sizeable lead. Six jams ending in a tied score, seven lead changes, and nine jams with matched scoring passes kept all 30 skaters on their toes while fans in attendance steadily raised the volume in the Ohio Building throughout the game. Fast pack speed in the first handful of jams minimized gains on both sides, but a star pass to Betty T. KayO helped Ohio capitalize on the first power jam opportunity in jam 6 and take an 18-14 lead. After the All Stars controlled the clock for three consecutive jams, Florence Fightingale picked up lead jammer status for Roc City in jam 11, but massive hits by Pain Train stalled her progress; meanwhile, Chainsaw took a star pass and hustled through the pack to steal 2 points for a 30-all tie. BrussKnuckles and Catch Mikachu denied scoring opportunities by speedy Roc Star jammers in two subsequent jams, briefly stonewalling scoring before a pile of penalties in jam 14 allowed a third lead change, 30-33. 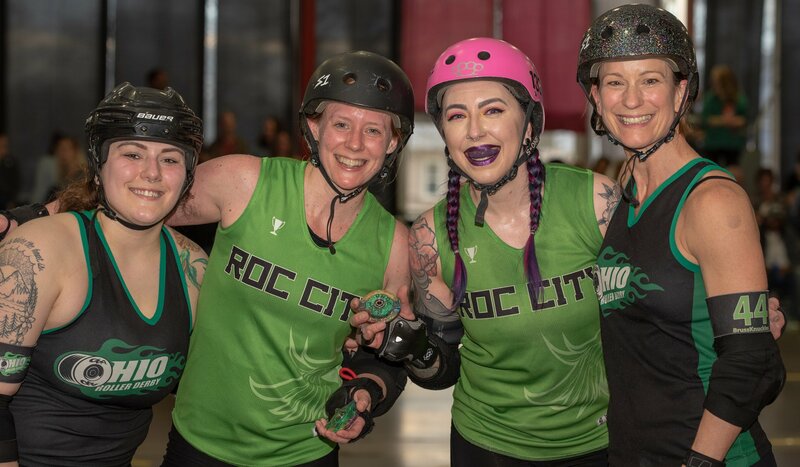 Pain Train immediately fired back as the Roc City jammer earned a track cut penalty, using a height advantage over the opposing defense to rack up 12 points and boost Ohio back into the lead. 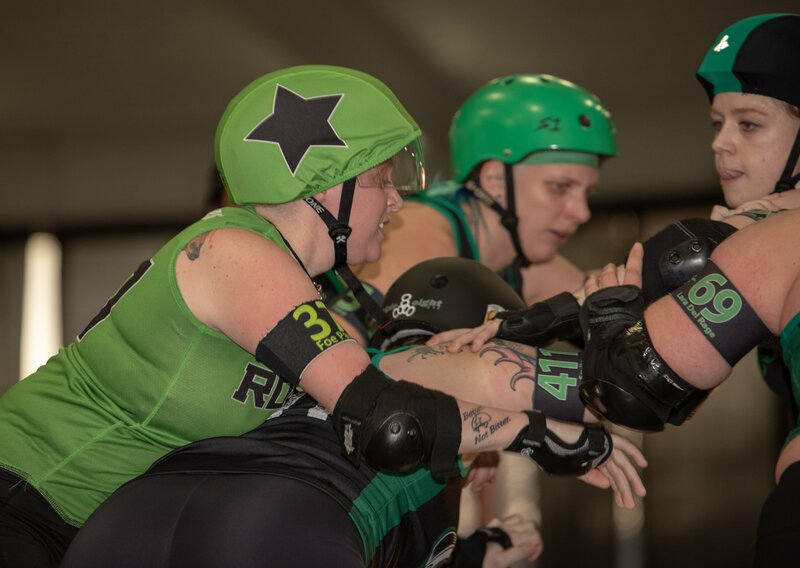 Penalties continued to plague both squads, but Bigg Rigg earned lead status on a power start and 8 unanswered points as Amy Spears, Lara Del Rage, and KloverKill worked over the opposing jammer on her return from the penalty box. Nipping at Ohio’s heels, Medusa Mayhem and GO! managed to narrow the point gap, but Mikachu quickly undid their work with 4 speedy points. With offensive assistance from Betty T. Kayo, BrussKnuckles easily escaped the pack in jam 22 and ran the jam long, trusting the defensive formations of Kelsey Khaos and Baby Kakes and jumping over downed skaters for a 20-4 gain, the highest-scoring jam of the period for either side. Leading 86-69 at halftime, Ohio matched points in jam 23, but a penalty to the pivot-turned-jammer in the next jam gave Roc City a power start that allowed them to retake the lead despite swarming All Star defense, 94-97. Each team found just enough room to trade pairs of points over the next few jams, with Amy Spears calmly escorting the Roc City jammer out of bounds in timely moments. Charging up the inside line on toe stops, Bigg Rigg grabbed lead jammer in jam 31 and pushed Ohio back into the lead, 108-106, while Chainsaw and Vyles held the Roc Star jammer on an initial pass for 1:40. Roc City responded with fury, snagging lead status in three consecutive jams and retaking the lead for the final time with just over 15 minutes remaining in the game. A string of penalties spelled trouble for Ohio as Roc City exploited the abbreviated defense for 20 points. 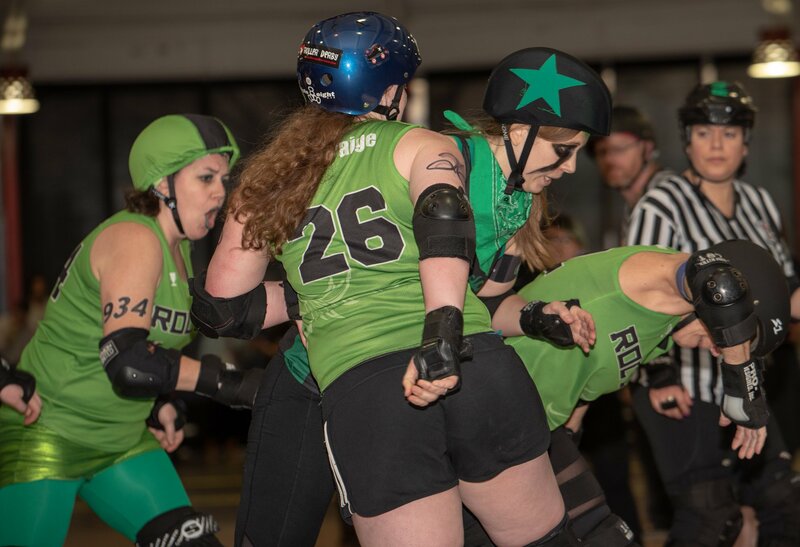 After a team timeout gave the All Stars a moment to regroup, they pushed forward, with Betty T. KayO and Birch Slap pummeling the opposing jammer and Pain Train acting as a last line of defense to press pause on Roc City. Down 117-154 but knowing that a win was still well within reach, Mikachu scooped up 12 uncontested points in jam 42, and judicious use of their remaining timeouts allowed Ohio jammers to breathe before attacking staunch defense once more. Thunderous cheers from the home crowd fueled the fire as Bigg Rigg and Mikachu alternated jams for a 13-2 gain; trailing 144-156, Ohio used their final clock stoppage to reset with 4 seconds on the period clock. Sweeping offense sprung Bigg Rigg free and into lead jammer status in the final jam, but Roc City was ultimately able to outscore the home squad 15-12 for a final score of 156-171. 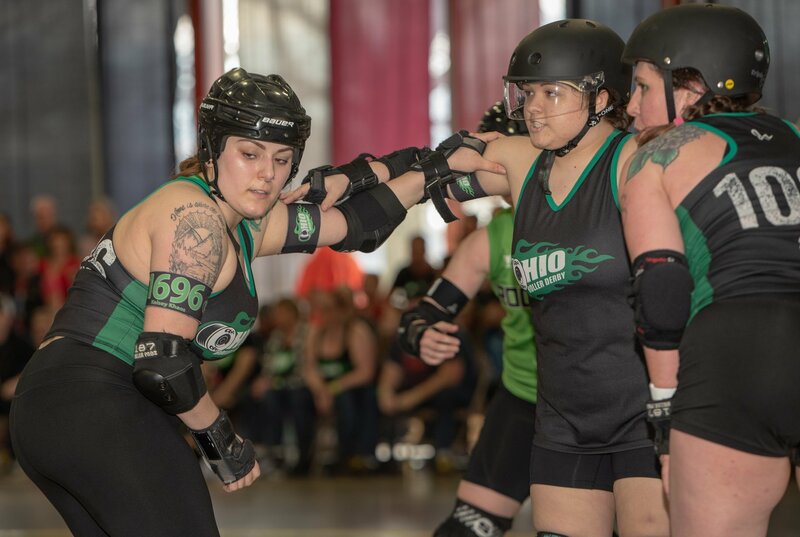 MVPs for Ohio were BrussKnuckles (jammer) and Kelsey Khaos (blocker). MVPs for Roc City were Florence Fightingale (jammer) and Kandy Krusher (blocker). 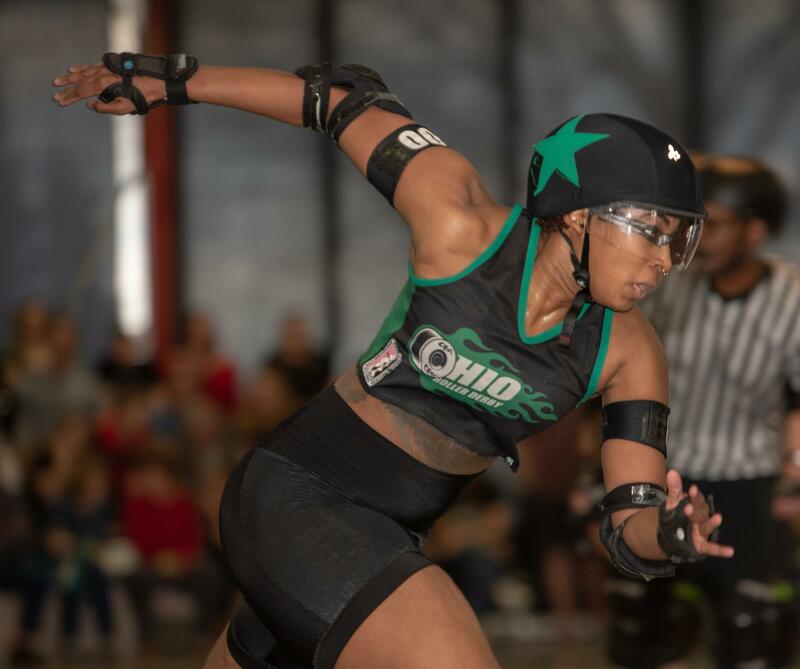 Unofficial lead status gain, jamming, and scoring for Ohio were: Catch Mikachu (10-16, 56 pts); BrussKnuckles (4-12, 22 pts); Bigg Rigg (8-16, 43 pts); Betty T. KayO (0-2 [2 star passes], 15 pts); Pain Train (1-7 [4 star passes], 14 pts); Chainsaw (0-1 [1 star pass], 2 pts); and Kelsey Khaos (0-2 [1 star pass], 4 pts). Unofficial lead status gain, jamming, and scoring for Roc City were: Florence Fightingale (8-16, 54 pts); GO! (9-17, 65 pts); Medusa Mayhem (5-9, 35 pts); DangSheFine (3-6, 17 pts); and Bam-B (0-1 [1 star pass], 0 pts). Hungry for a different outcome than the first game of the evening, Gang Green fought valiantly against the Roc City B-Sides, but narrowly missed a last-minute comeback in the final jam. The first points of the period went to the B-Sides, but Jane, Literally made the first strike for Gang Green in jam 3, picking up lead jammer status and 12 unanswered points to hoist the home squad into the lead. Two jams later, back-to-back lead jams allowed Roc City to tip the scales back in their favor before lightning-quick jamming and point denial held the score at 16-21 for three jams. Taking the pivot line to maximize movement options, Lara Del Rage fed the B-Side jammer to a constantly-recycling Gang Green wall in jam 11 while TactiGal matched their points. Near-simultaneous penalties to two Rochester blockers and their jammer in jam 13 handed Gang Green their first power jam opportunity of the game; ducking under teammates’ arms on a scoring pass, Ka-Pouch! scooped up an additional 12 points and narrowed the differential to 32-38. The B-Sides locked down defense, holding Gang Green scoreless for four consecutive jams before the momentum shifted during a power opportunity in jam 18. Brutal blocking by Avocado ToeStop brought ShaDyNasty to a halt on the initial pass; meanwhile, Baby Kakes and Jane, Literally provided distraction in the pack while TactiGal slipped through untouched for 16 points. With 8 minutes on the period clock, both sides found it difficult to make significant headway in the remainder of the half, trading points and keeping the point spread narrow. A double penalty to the B-Sides jammer just before halftime handed Gang Green a seemingly golden opportunity, but a scrum pack burned 50 seconds of the power jam and garnered only a 2-point gain. Eager to close the 60-81 gap, the Ohio jammers turned the volume up to 11 at the start of the second period. While Slayna Scully and Baby Kakes locked in on the B-Sides jammer, Smash Panda nabbed lead status, sliding around the outside of the pack for an 11-1 gain and kicking off a streak of Gang Green clock control that allowed them to outscore their opponents 27-13 over four jams. Stalwart defense by Kegel Scout, Oxford Coma, and Lara Del Rage held Foe Paws on an initial pass for most of jam 34, giving Ka-Pouch! time to rake in 12 points and flip the lead, 99-98. Roc City retaliated in the following jam, picking up 4 points and re-emerging on top before the jam was called prematurely for injury. Unfazed by the extended timeout, Jane, Literally sprinted away on a subsequent power jam, easily gathering 12 points to open a 111-105 lead, but that lead was erased for the final time in jam 37 as the B-Sides found 7 unanswered points on a power opportunity. 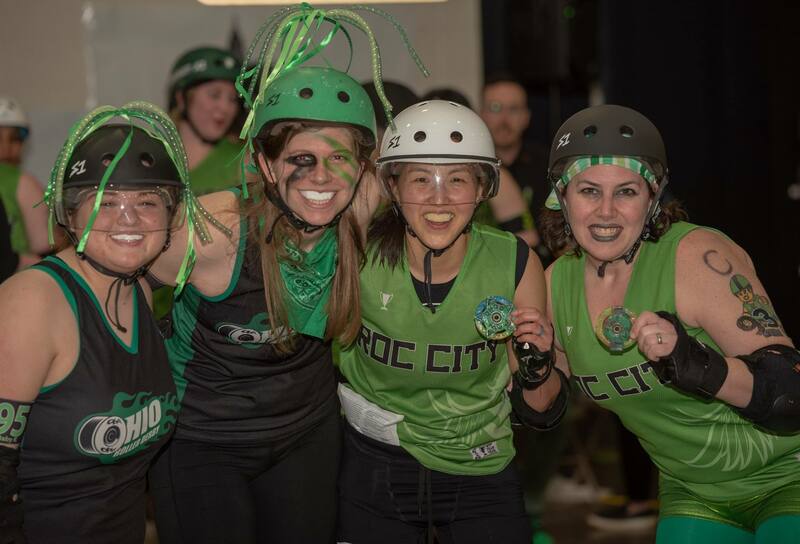 Gang Green refused to let the Roc City contingent find a comfortable cushion, chipping away at their lead with small handfuls of points to remain within striking distance. In the final 10 minutes of the game, a string of ill-timed penalties provided the B-Sides with pack advantages and two power starts, but Oxford Coma hopped around the pack to reabsorb their jammer and give Ka-Pouch! and Jane, Literally time to negate a few of their points. 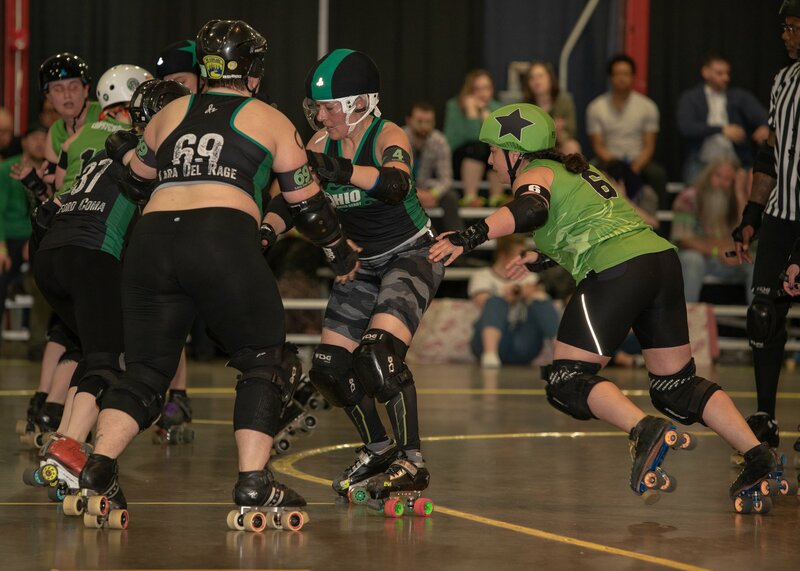 Surging ahead of the defense to earn lead jammer status, Belle A. Trix pushed Gang Green within reach of a comeback in the second-to-last jam, tiptoeing up the inside line for 16 clean points with offensive assistance by Foxy Force. Trailing by just 7 points, the home faction left everything on the track in the final jam, but Roc City snagged lead and doubled up on points for a final score of 146-157. MVPs for Gang Green were Jane, Literally (jammer) and Baby Kakes (blocker). MVPs for the B-Sides were ShaDyNasty (jammer) and Post Mortimer (blocker). Unofficial lead status gain, jamming, and scoring for Gang Green were: Belle A. Trix (2-10, 22 pts); Smash Panda (5-10, 23 pts); Jane, Literally (6-12 [1 star pass], 44 pts); Ka-Pouch! (3-10, 35 pts); TactiGal (2-6, 22 pts); and Baby Kakes (0-1 [1 star pass], 0 pts). Unofficial lead status gain, jamming, and scoring for the B-Sides were: Fifth Hellement (8-9, 36 pts); ShaDyNasty (9-13, 45 pts); Foe Paws (4-10, 19 pts); BustaMove (4-13, 45 pts); Post Mortimer (0-2 [2 star passes], 1 pt); and Grimlyn (1-2, 11 pts).